beautiful nature. There are versatile services in the centrum of Jämsä. refueling. Trail is variable combination of sand, rocky ground, swamp and boreal forest. washing abilities, good views for audience and sportscaster. Jämsä. 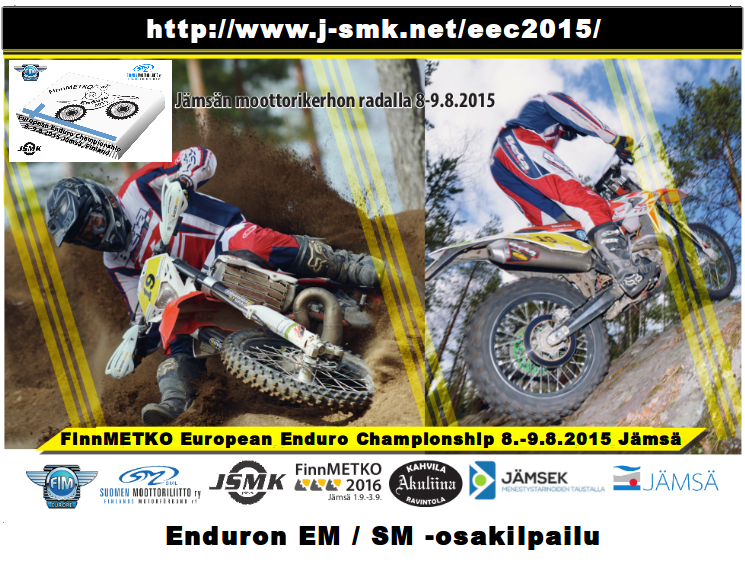 EEC-competition paddock is only 6km from the city centre of Jämsä. Info-office is open 5.8. – 9.8.2015 from 9:00 a.m. to 6:00 p.m.
Area training open from 3:00 a.m. to 5:00 p.m.
Area training open from 9:00 a.m. to 12 p.m.
Ilmoittautuminen / Administrative from 10:00 a.m. to 4:00 p.m.
Katsastus / Technical inspection from 11:00 a.m. to 5:00 p.m.
Kilpailun avajaiset / Opening ceremony at 6.30 p.m.
Prize-giving ceremony about at 6:00 p.m.